Chosen from days of old to be the Forerunner and Baptist of Christ God, the Saviour of the world, Divinely-praised John, while glorifying the Lord Who glorified thee, we sing thee hymns of praise as to the greatest of those born of woman, as to an angel in the flesh and preacher of repentance. For as thou hast great boldness before the Lord, free us from dangers of all kinds and move us to repentance, as we cry to thee with love: Rejoice, great John, Prophet, Forerunner and Baptist of the Lord! Rejoice, thou who wast filled with the Holy Spirit even in thy mother’s womb! Rejoice, good source of thy father’s silence! Rejoice, change of thy mother’s tears into joy! Rejoice, removal of her reproach among the people! Rejoice, great consolation for those who gave thee birth! Rejoice, for in the sixth month after thy conception, the Most Holy Virgin Mary was visited by an angel in Nazareth! Rejoice, for many rejoiced over thy birth! Rejoice, for thou didst receive a Grace-filled name, given by an angel! Rejoice, for by thy name the silence of thy father Zachariah was ended! Rejoice, for the name of God was blessed by thy father on account of thee! Rejoice, for fear and wonder over thy miraculous birth came upon those living round about! Rejoice, for the news of thy miraculous birth spread over the entire land of Judea! Rejoice, for by thee salvation appeared to many in this world! The power of the Most High ended the barrenness of the righteous Elizabeth, who was beyond the natural age for bearing children, for she conceived thee, the glorious Forerunner of the Lord, and keeping this secret for five months, she said: For thus hath the Lord dealt with me in the days wherein He looked on me to take away my reproach among men. But when she received Her Who bore Christ in Her Womb, she was filled with the Holy Spirit and cried with a loud voice: Whence is this to me that the Mother of my Lord should come to me?, and rejoicing with Her, she cried unto God: Alleluia! Rejoice, while still in thy mother’s womb proclaiming with miraculous gladness the Lord Who glorified thee! Rejoice, for because of thee and thy mother Elizabeth the incarnation of Christ was revealed! Rejoice, for she also was filled with the Holy Spirit! Rejoice, for she appeared as a most marvelous prophetess! Rejoice, for by her the Most Holy Virgin Mary was called blessed among women! Rejoice, for by her She was also named the Mother of the Lord! Rejoice, for Her seedless fruit was declared most blessed! Rejoice, manifestation of divine wisdom! Rejoice, blessing of a holy marriage! Rejoice, wonderful offspring of a barren womb! Rejoice, thou who astonished men by thy birth! Rejoice, radiant voice of the Word! Disturbed by a storm of doubt, the priest Zachariah was unable to speak, according to the angel’s word. But when after thy birth, O Forerunner of the Lord, he wrote thy Grace-filled name, immediately his lips and tongue were loosened, and he spake, blessing God and prophesying, saying: Blessed by the Lord God of Israel, for He hath visited and redeemed His people, and thou, child, shalt be called the prophet of the Highest, singing unto Him: Alleluia! Rejoice, thou who wast filled with manifestations of Grace from thy conception! Rejoice, thou who wast glorified by God in thy birth! Rejoice, thou who wast in thine infancy called a prophet of the Most High by the father! Rejoice, thou who wast in thy childhood enlightened and strengthened by the Holy Spirit! Rejoice, thou who wast a blood relative of God incarnate! Rejoice, thou who didst receive from God the lofty calling of Forerunner and Baptist! Rejoice, ray proclaiming New Light to the World! Rejoice, star illumining the path that leadeth to Christ! Rejoice, morning star of the unsetting sun! Rejoice, lamp of the Never-waning Light! Rejoice, thou who preparest the way for the approaching Christ! Rejoice, thou who appearest as both angel and man! 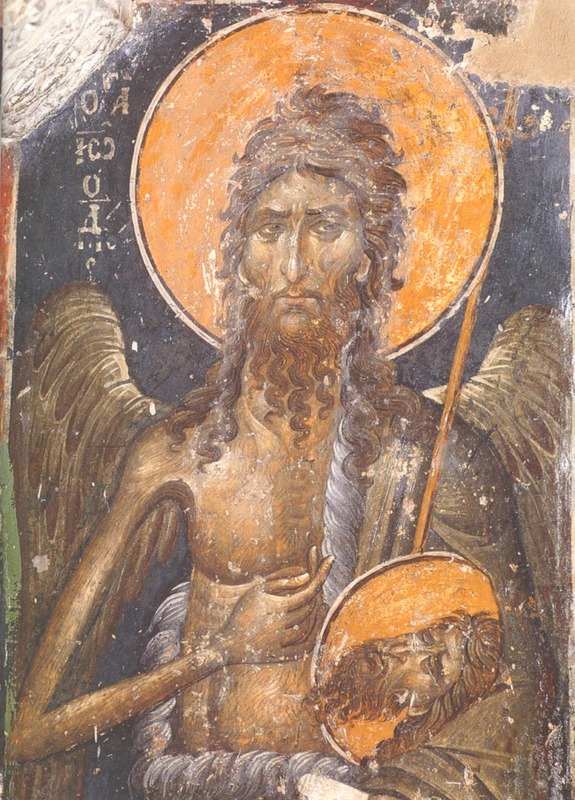 The ungodly command of the lawless murderer of children, Herod, drove thee out of thy father’s house into the trackless wilderness, carried by thy mother, O Forerunner of the Lord, and there thou didst abide until the day of thy appearance unto Israel, eating akrida and wild honey, and calling to God: Alleluia! Rejoice, for, while yet an infant, thou didst terrify King Herod! Rejoice, thou who wast preserved from his vain murdering by the right hand of the Most High! Rejoice, fragrant rose of the desert! Rejoice, thou who amazed all by the height of thine ascetic labors! Rejoice, faithful indicator of the true way! Rejoice, most wonderful preserver of purity and chastity! Rejoice, perfect example of the self-denial of the Gospel! Rejoice, monastics’ protection and security! Rejoice, enlightenment of theologians’ minds! Rejoice, thou who dost open the doors of God’s compassion to the sinful! Rejoice, thou who dost help to bring forth fruits worthy of repentance! A glorious preacher, a Divine Forerunner, wast thou shown to be in the desert of Jordan on the day of the appearance of Christ God to the world, for upon His approaching thee, thou didst show Him to the people, saying: Behold, the Lamb of God Who taketh away the sin of the world! And we, having known Him through faith, sing unto Him: Alleluia! Rejoice, herald of the coming of the Messiah! Rejoice, preparer of the paths of the Lord! Rejoice, intercessor of the old and new Grace! 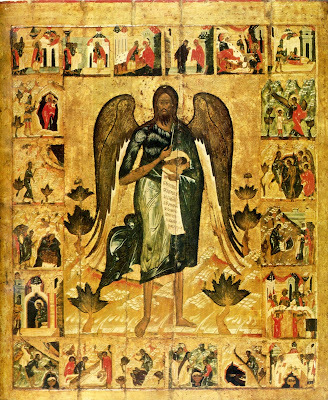 Rejoice, end of the prophets and beginning of the apostles! Rejoice, renowned voice of the Word! Rejoice, thundering preacher of repentance! Rejoice, thou who didst convert many of the sons of Israel to the Lord! Rejoice, thou who didst make people perfect for the Lord! Rejoice, thou who boldly didst expose the Pharisees and Sadducees! Rejoice, teaching to bear fruit worthy of repentance! Rejoice, indicator of spiritual enlightenment! Rejoice, untiring intercessor for those seeking thy protection! When the Lord Jesus wanted to be baptized, O Divinely blessed John, thou didst say: I have need to be baptized of Thee; however, submitting to Him Who said, Let it be so now! Thou didst raise thy right hand upon His head and having baptized Him Who did not need purification, thou didst cry out: Alleluia! Rejoice, first preacher of the Trinity’s Theophany! Rejoice, true worshipper of the one God in Three Persons! Rejoice, clear beholder of the Holy Spirit in the form of a dove! Rejoice, witness to His descent from the Father upon the Son! Rejoice, hearer of the voice of God the Father from Heaven! Rejoice, beholder of the revelation of the Father’s love for the Son! Rejoice, chosen baptist of the Son of God! Rejoice, fulfiller of His holy will! Rejoice, zealous struggler in the glorious service for the salvation of the human race! Rejoice, first celebrant of the great Mystery of Baptism! Rejoice, herald of divine joy! Rejoice, first teacher of the New Testament! 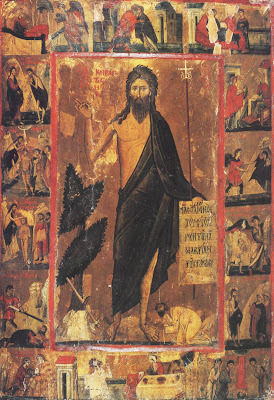 Having beheld the strange and ineffable humility of the Incarnate God the Word, O Divinely-blessed Baptist, when He bowed His Divine Head to thee and received a servile baptism, thou thyself wast wholly filled with great humility. Entreat therefore this Divinely-loved virtue for us also, who are possessed by pride, that we may cry to Him from a humble heart: Alleluia! Rejoice, planter of the law and statutes of the Lord! Rejoice, exposer of Herod’s lawlessness! Rejoice, zealot for his correction! Rejoice, thou who didst suffer imprisonment and bonds for the sake of righteousness! Rejoice, thou who wast beheaded for the truth! Rejoice, for thy body was given an honorable burial by thy disciples! Rejoice, for by God’s providence thy head was preserved incorrupt! Rejoice, for it has granted consolation, sanctification, and healing to Christians! Rejoice, for the faithful piously bow down also before thy right hand which baptized the Lord! Rejoice, for many miracles are thereby accomplished even to the present day! Rejoice, for by thee the faithful are delivered from the dishonor of passions! Rejoice, for by thee the sinful are moved to repentance! The angelic realm was amazed at the loftiness of thy ministry, and the Church reverently praiseth thee as the friend of Christ God, coming before Him in the spirit and power of Elijah. For, zealous for truth, thou didst boldly expose the Pharisees and lawless Herod, from whom thou didst receive a martyr’s end. Therefore, we bow down before thy holy head, and pray to thee: deliver us from the dishonor of passions, that with a pure heart and lips we may chant: Alleluia! Rejoice, great glory of the Church of Christ! Rejoice, most marvelous wonder of the angels! Rejoice, joy and glorification of the forefathers! Rejoice, lofty praise of the prophets! Rejoice, divinely-illumined crown of the apostles! Rejoice, magnificent beauty of hierarchs! Rejoice, beginning of martyrs in the new Grace! 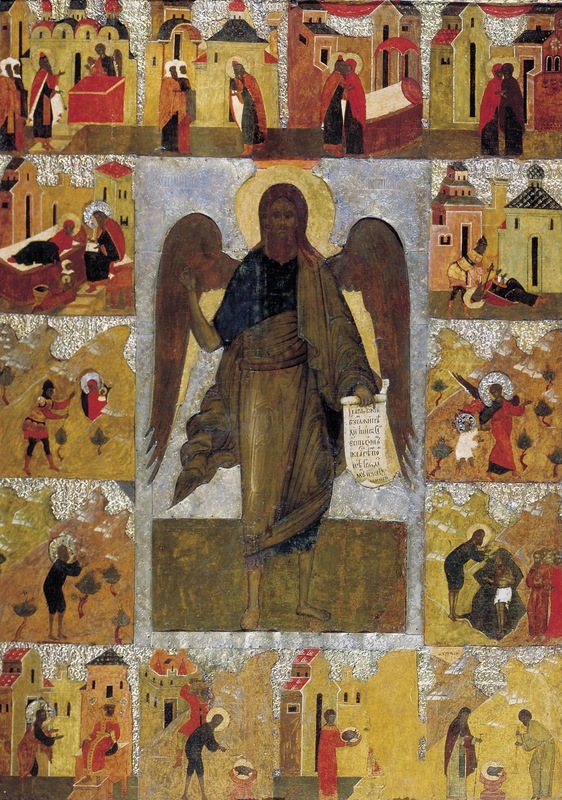 Rejoice, perfection of holy monastics! Rejoice, adornment of the righteous! Rejoice, foundation of virgins and fasters! Rejoice, great consolation of all Christians! Rejoice, for thy name is glorified by all Christian generations! 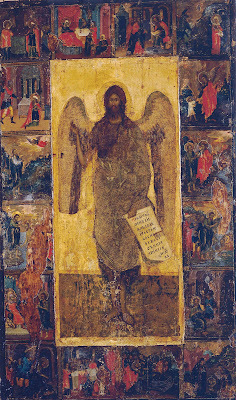 Thou didst proclaim to those in Hades the good news of Christ, come in the flesh to save the world; for like the morning star preceding the sun, thou didst illumine those sitting in the darkness and shadow of death, whence thou wast soon lead forth by the Lord with all the righteous from the beginning of the age, chanting to Him as the Deliverer and Conqueror of death: Alleluia! Rejoice, our mighty intercessor and faithful preserver from harm! Rejoice, quick helper and deliverer of those suffering from the spirits of malice! Rejoice, thou who dost send down the blessing from God on the barren! Rejoice, thou who dost deliver those who run to thee with faith from great disturbance of passions! Rejoice, thou who dost quickly reconcile those who are at enmity! Rejoice, thou who dost grant speedy help to those who fervently hasten to thee in every need and sorrow! Rejoice, thou who dost rescue those who are running the good race from self deception and prelest! Rejoice, thou who dost help those who entrust themselves to thine intercession at the hour of death! Rejoice, thou who by thine intercession dost deliver those who love thee from the toll-houses of the air! Rejoice, thou who dost vouchsafe eternal life to those who honor thy glorious memory! Rejoice, defense of the poor and widows and orphans! Rejoice, after God and the Theotokos, the refuge and hope of Christians! No hymn is sufficient to praise thee according to the legacy of thy great deeds, O Baptist of the Lord. But we, compelled by love, dare to hymn thy greatness. Do thou mercifully accept this from us, O intercessor before the Throne of the Most Holy Trinity, and pray to free us from every sinful corruption, that with pure heart and lips we may chant to God: Alleluia! Rejoice, eyewitness of the Divine Light shining from on high! Rejoice, thou who dost praise God by the light of thy virtues! Rejoice, thou who dost reveal the majestic glory of the Most Holy Trinity! Rejoice, thou who dost point out the correct and marvelous path to Heaven! Rejoice, harbinger of the good news of God Incarnate for those in Hades! Rejoice, bearer of glad tidings for the righteous held in the nether regions from the beginning of the age! Rejoice, sincere friend of the Master, Christ God! Rejoice, thou who dost reveal to the world the True Light! Rejoice, radiance of the shining light of the Gospel! Rejoice, glorification of the Christian race! Rejoice, fulfillment of the Counsel of God! Rejoice, for from the rising of the sun unto the going down of the same thy name is to be praised! Bearing the name of Grace, O Baptist of the Lord, and enriched thereby, thou didst appear as a most glorious bearer of victory; for thou didst conquer enemies and every malice, and thou didst seal thy ministry with martyrdom. And now, standing before the throne of the King of kings, entreat Him to grant to all the faithful victory over their enemies and Godspeed in all things, and the strengthening of Grace in virtues, as they chant to Him: Alleluia! Rejoice, universal apostle and first martyr of the New Testament! Rejoice, first preacher of the Kingdom of Heaven manifested by the appearance of Christ on the earth! Rejoice, foreteller of the divine calling of the gentiles! Rejoice, thou who didst manifest unto the world the hidden and secret things of the wisdom of God! Rejoice, thou who wast shown to be more fruitful than others in divine deeds! Rejoice, for by the light of thy deeds the Heavenly Father was glorified! Rejoice, for thou dost unspeakably gladden the Church of Christ concerning thy memory! Rejoice, for now thou dost eternally enjoy abundant gladness! Rejoice, illuminated by the divine rays of the Light of the Three-sunned Light! Rejoice, for thou dost unceasingly chant with the bodiless ones the thrice-holy hymn to God! Rejoice, for now with the mirror removed, thou dost directly behold the Holy Trinity! O great and most glorious John, Forerunner and Baptist of the Lord! Receive from us now this supplication offered to thee, and by thy prayers, which are pleasing to God, deliver us from evil of all kind, and rescue us from eternal torment, and make us heirs of the Kingdom of Heaven, that throughout the ages we may chant unto God: Alleluia! This Kontakion is recited thrice, whereupon Ikos 1 and Kontakion 1 are repeated. O Baptist of Christ, Holy Forerunner, last of the prophets, first of the martyrs, instructor of fasters and desert-dwellers, teacher of purity and close friend of Christ! I pray thee; I run to thee. Do not reject me from thy protection, but lift me up who am fallen in many sins; renew my soul by repentance, as by a second Baptism. Purify me, corrupted by sins, and compel me to enter therein where no corruption can enter: into the Kingdom of Heaven. Amen. Thanks for posting this! What's the source? Did you translate it or find it on a website in English? 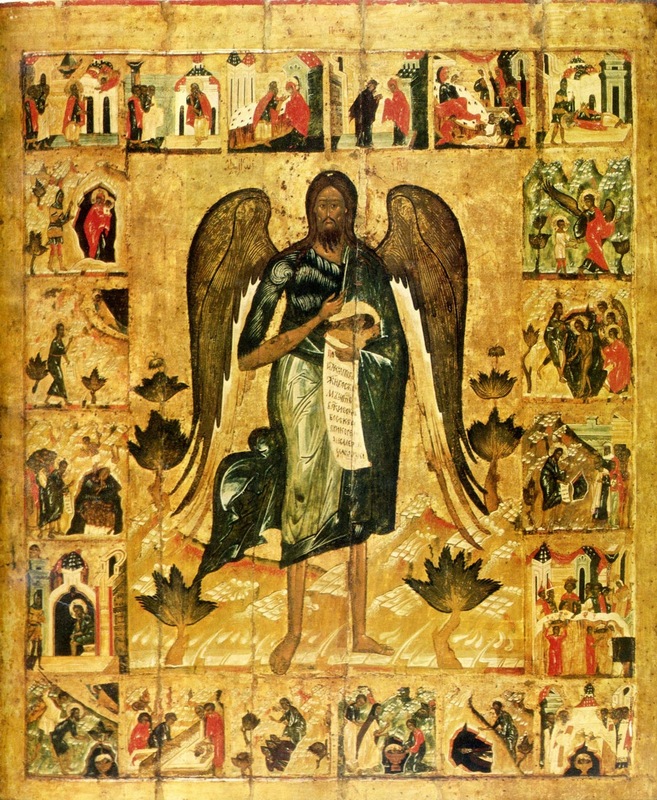 The link I included above is to the full Akathist to the Forerunner in English (http://www.osjknights.com/3%20Prayers/Akathist%20to%20Saint%20John%20the%20Baptist.pdf). I'm not sure who the translator is.